BMO from Comedy Central’s Adventure Time is adorable, if only someone would make one that can walk! Atleast we can make one with a personality. Here is a build using easy to get parts including Arduino Pro Mini, Nokia 3310 LCD screen, audio playback, accelerometers, and distance sensors. My time was taken making her voice, expressions, and personality, you could easily extend this platform and add a music player or games. If you want to add more buttons or sensors you will need to add more or bigger Arduinos. 19 of the 20 GPIO pins are taken up with controlling the audio, LCD, buttons, and sensors. I even had to use a couple analog inputs for buttons. I admit that it was quite a challenge to pack all the electronics in such a small package. 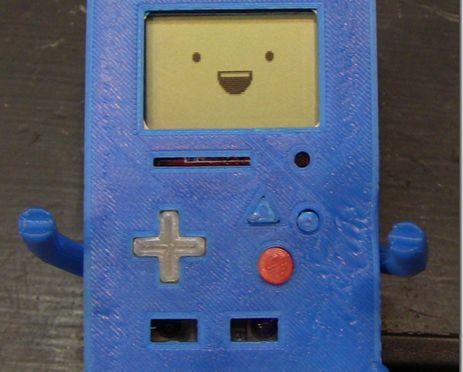 If I ever make another BMO I will use a larger LCD screen so the dimensions would be correct to use an Arduino Mega, Raspberry PI, or Beagle Bone Black. I intended to have battery power as well however I ran into issues running on a single cell LIPO, I am not sure that I will finish the battery power feature.